Alright, we get it. Everybody has excuses with stuff they know little about and blogging can be one difficult thing to understand. But let’s be honest. It looks fun, right? The little money on the side also doesn’t hurt. Thing is, while Blogging looks and sounds complicated, it’s actually quite easy all thanks to technology and trusty developers. This guide is created to show people with little information of the Internet that they can actually start Blogging right away. But before that, let me tell you about a good friend of mine. See, this friend of mine works at a 9 to 5 job and has a family of 5. When you look at him, you really get this “regular guy” kind of vibe from him and that is a pretty good judgement of my friend. One thing my friend likes doing is fishing. Oh how I remember him being able to talk endlessly when talking about baits and tackles. It was something that he was really passionate about. That’s when I asked him “Why don’t you start a blog?”. His answer was quick and disheartening “I tried but it was too difficult for me”. That’s when the idea hit me. If I can help this guy start a blog then I can help just about everyone. The most “technical” thing this friend of mine can do with his laptop is use word processors and visit web pages. So I started teaching him the basics starting from making him understand why I urged him to make a blog. It has been 6 months since I taught him how to create his own blog and he might not be making hundreds of dollars a month but seeing him nowadays is really encouraging. Now, he has a number of followers who he can talk to about fishing. He even started to do some Youtube videos due to a number of requests. He was doing something he loved and that tops it all. This is a very simple question that a few people can start with a straight face. Is it to earn some extra cash? Is it to get people to see what you do? Or is it so you can share what you know to the rest of the world? For some, blogging can be therapeutic. It’s like releasing pent up emotions or ideas. For others, it is a way to connect to more people who like the same things you do. For these kinds of people, the extra cash comes as a bonus. Some might say “I can’t possibly blog… Nobody will read what I have in mind.” Remember my friend I told you about? He said the same thing but now he has a group of people he talks to every weekend. What I always tell people is that “If you have something good to say and you say it in the best way possible on the Internet then people are bound to hear it”. Now, you might get all giddy at this point and I understand. That’s the main reason why I made this guide. I want blogging to be as accessible as possible to as many people. How I taught my friend was no chance action. It was a test run for this very guide. This guide will teach you how to make your own blog in 20 minutes or less. If you think 20 minutes is too short then you are probably right. But don’t worry. The idea is to keep everything simple, up-to-date, specific, and easily digested. If you are already quite knowledgeable, the length might bore you but you will still find nuggets of wisdom peppered here and there all throughout the guide. Expect a number of steps that will sound technical but I will do my best to make it sound as human as possible. We will also be pointing out some of the more common mistakes that people make when starting their own blogs. To sum it all up. The main goal of this guide is to make making a blog as easy as possible for everybody. Now, if we are done getting hyped up. Let us start with the good parts. Just like any other endeavour, you gotta start somewhere. Now, this is the part where you ensure you sit comfortably on your chair, maybe get a fresh glass of water from the fridge, set your phone to silent mode, and to tell your partner that you will be having a quick “me” time. Do I have to pay to get a blog started? Thank you dear reader for that wonderful question. Now, this is a legitimate first question, why? Well, because there’s actually two ways to start a blog. There’s the I-don’t-want-to-spend-a-penny method and there’s the I-am-doing-this-so-a-few-dollars-won’t-hurt method. Unlike all the other experts out there. I won’t be telling you that going for a free blog on various blogging patforms is bad. To be perfectly honest, that’s where I started. See, I was at the very same seat your are sitting at right now. I spent 3 years on a free WordPress page and now here I am. You know what I realized? That I wasted 3 years of my blogging life. Thing is, if I had the power to go back in time I would have definitely spent the meager amount needed to start my own blog on my own domain and hosting. With all the time and effort I spent with my free blog, I would’ve gone farther than where I am now if I used a self-hosted blog. So there. If you want to just try out blogging then starting with a free blog is more than OK. Get the feel of crunching out content every now and then and customizing your blog (albeit very limited). 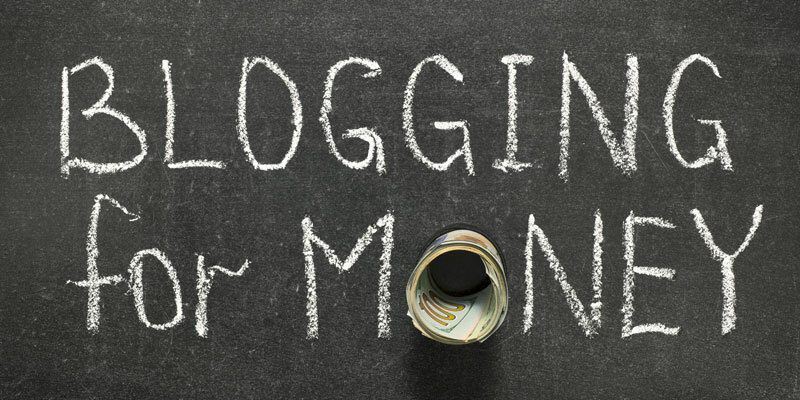 But if you want to go and really start blogging then you better make sure you are ready to spend a few dollars for the essentials. Plus, this guide won’t talk about starting on a free blog platform so you are on your own on that one. It should be as short as possible. People won’t remember maybetodaynahidontcare.com. But they will remember www.iremember.com for sure. It should more or less be related to your blog name. It will totally be weird if you have the domain name www.cuteponies.com but is a website about swords and knights, right? In this case www.poniesofwar.com is much better. Now that you are done with choosing your domain name or web address. Let’s find a place where we can set up our blog. Just look at it this way. Your blog is a home and you already have an address. What you need now is a tract of land where you can place your home. At this point it might sound a bit technical but trust me on this one, technology has made everything so accessible so you won’t have to worry about a thing. 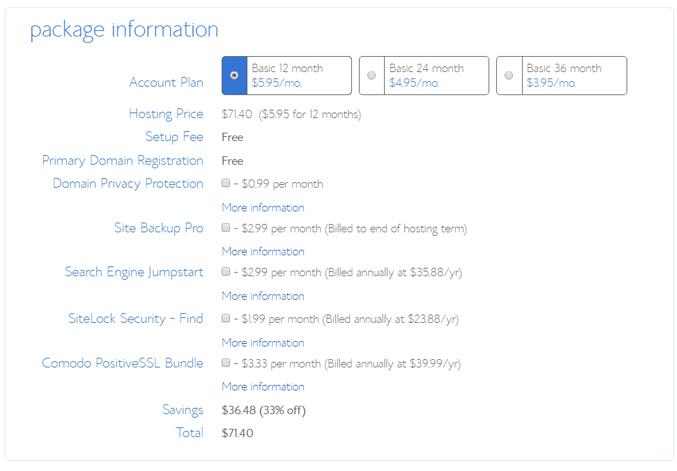 That’s why I recommend web hosts like Bluehost for people who are just starting. Why? 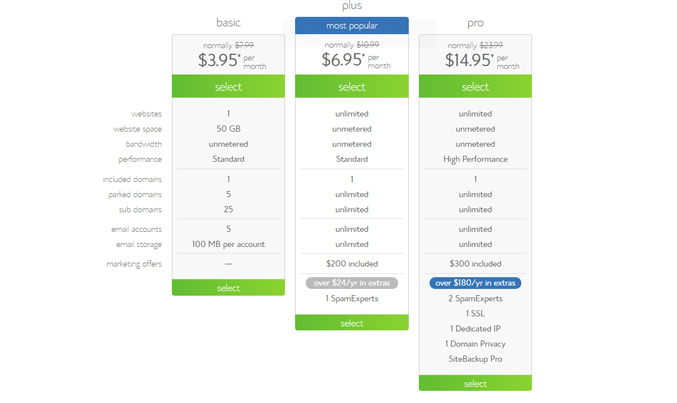 Because Bluehost is simply the most beginner friendly web host out there. This is aside the fact that they have various packages that will suit the every need of different kinds of users. They even have a package specially made for people who are starting out with their blogs. 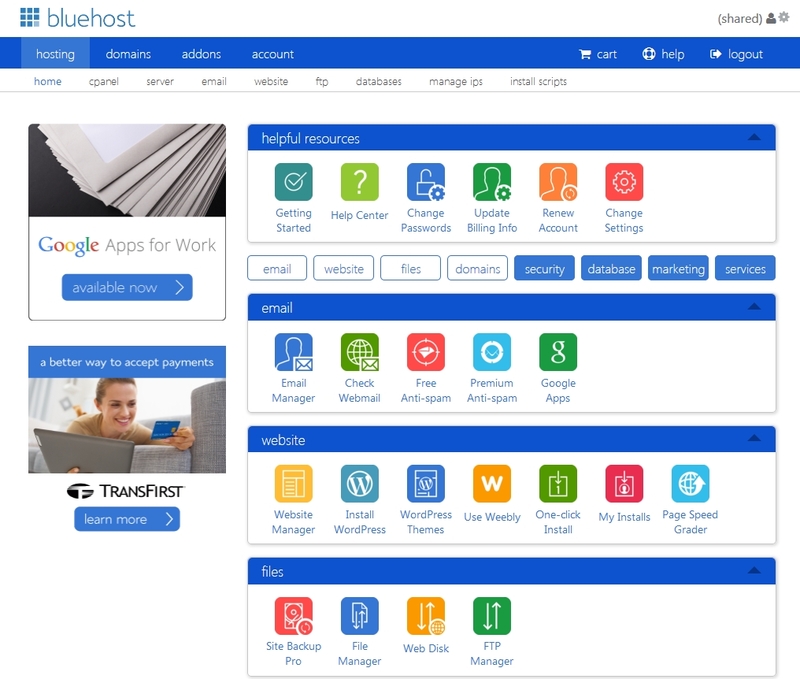 We have a separate guide (which is equally as easy to read as this one) on how to sign up with Bluehost. 1. 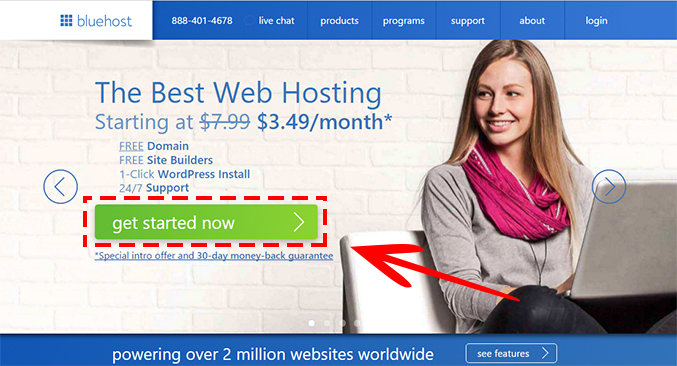 Click here to go to Bluehost web site and then click on “get started now”. 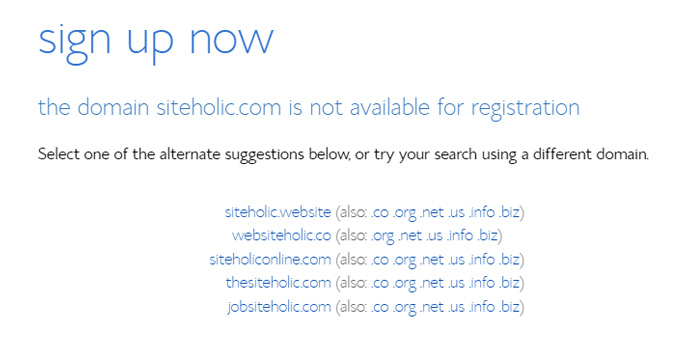 Don’t beat yourself when thinking of a domain. Just make sure it is catchy and is related to your interest. For example, if you plan to write about dogs in your blog johanadogs.com works. I’d suggest you to use something that ends with .com, .net or .org. 5. After choosing your domain name, you will be redirected to the page where you have to fill your account information. Congratulations you’ve made your first blog blog. On the next step I will show you how to use WordPress and how to customize your new blog. There was a time when starting a new blog meant having to contact an expert to work out the HTML for you. All you can do was to submit whatever content you want posted and they will tweak the static website every time you want to add new content. Thank God we got over that hump. WordPress, along with other content management systems, offered a very easy way for people to share their content to the rest of the world. We are talking about millions of users posting everything from audio, video, and text content. But why WordPress over other content management systems? What makes it so special? Why do people prefer using it over the others? In order to answer these questions, let’s try to talk a little bit about WordPress and where it started. The story of WordPress started with b2 which is considered as one of the first news or weblog tools which is also known as logware. The premise of the creation of b2 was quite simple – to provide an easy way for people to publish content on their own websites. Back in 2001, this was revolutionary. In 2003, Matt Mullenweg and Mike Little decided to take b2 and develop it independently which resulted to WordPress. Since then WordPress has seen multiple changes and developments from the introduction of themes, plugins, and improved media experience. 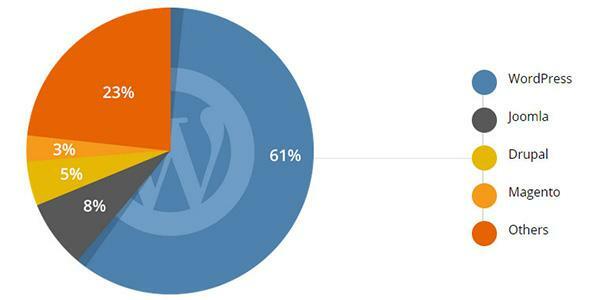 Today, around 61.4% of the websites online are using WordPress as their content management system. The sites range from Top 10 sites to an ordinary guy’s blog. Over 409 million people go and check out up to 21.5 billion pages on a monthly basis. WordPress also boasts over 55.8 million new posts a month. The numbers are indeed staggering but it does tell us a good story. WordPress is the number one content management platform for a lot of people from the seasoned veteran to the amateur blogger. WordPress is flexible and customizable to suit the needs of expert users but is also easy and user-friendly to make it a breeze to use for starters. There are blog pages that uses WordPress and there are also amazing websites that look like they would cost you hundreds of thousands of dollars but are actually made on WordPress. Another great thing about WordPress is that you won’t need to take a 4-year course just to master it. Reading this guide will give you a headstart and a few minutes tweaking with it will make you confident enough to use it. The whole system was created with the first-time user’s experience in mind. It is also worth noting that WordPress is free. Free as in you don’t have to spend a dime to use it. Using WordPress is as easy and fast as installing it through your Web Hosting dashboard. What you get is the default WordPress kit that will allow you to customize your blog and add content. If you want to expand this kit and add some premium features, then you might need to spend some money but it is not really necessary especially when you are just starting a personal blog. So now that you have a good idea of WordPress’s history and the mission and vision of its creators. Let us now dive in and start our short crash course. Let us start with differentiating the 2 “areas” in a WordPress page. In order to use WordPress to its fullest, one has to understand how it works first. You have to get a good understanding of the platform so that you will know how it can best serve you. Let us start with the two parts of a WordPress page – the front-end and back-end. The distiniction between the two is pretty easy. The front-end is what your customers sees and interacts with while the back-end is where you make sure everything works properly. Think of it like a restaurant, the front-end of your website is the dining area. This is where your customers can taste the wonderful food you have prepared. This is also the place where they can order, feel the ambience, or experience your other amenities. The back-end, on the other hand, is the kitchen and office area. Though not visible to your customers, this is where the real magic happens. This is the place where food gets cooked and decisions with the whole restaurant are made. Whatever changes on the back-end will appear on the front-end. To see the front-end of your site just type in your domain name in the browser(the domain name of this web site is siteholic.com). The back-end however, is a bit exclusive. To access it, you have to go to your domain.com/wp-admin and you should type in the username and the password which you have chosen during the WordPress installation proccess. This is to prevent people with malicious intent from changing your website from the back-end. Now that we already understand the difference between the front-end and back-end, let us focus our attention on the back-end of your page. This is where you will be creating posts, changing themes, or adding plugins. Don’t worry if you don’t understand what I am saying now. We will deal with them in a while. Now that you have accessed the back-end of your WordPress page let’s try to talk about what you will see the moment you enter the back-end. After logging in, you will be taken to a new page called the website dashboard. Consider this as the heart and soul of your website. The dashboard acts like a command center where you can check on stats, update posts, or change settings for your website. This is where you will do all the administrative tasks for the website. To better understand the dashboard, let us talk about each tab or menu to be found on the left side of the screen. This is where you will see all posts on your website. Want to make a blog entry? You go here. Want to change a post you made a few months back? This is where you want to be. This is also the place where you can create categories or tags for your posts. While these two might not be that important for now, if you decide to blog regularly then creating categories and tags will be necessary as they will ensure that your blog entries can easily be seen and identified by your readers. Posts are usually posted in reverse chronological order which means the latest posts are placed higher on the home page. Similar to posts but this time around it will be for whole pages. One of the main difference between posts and pages is that pages are considered static and are not really listed by date. Most pages are considered “one-off” kind of content that get rarely changed or updated. Examples include About Us pages or Mission and Vision pages. Well, you might be making changes to pages but you won’t be making it on a daily basis. Pages aren’t arranged with the help of categories and tags and are hierarchical in nature. This means you can have sub-pages underneath pages. For example, a page entitled “Pet Pics” can have sub-pages for Cat Pics, Dog Pics, or Tiger Pics. A website without any form of media like pictures, videos, or audio is certified boring. That’s why you need to remember to use media properly on your website. If you are uploading new media on your page then this is where you will go. This is also where you can check out all the past media you have uploaded on your website. This will make it easier for you to find that the cat picture you uploaded 3 years back. As soon as you get some traffic on your website, you will notice that some people like to impart their opinions on your posts. This is where you can check and moderate comments on your website. You will have the choice to either auto-approve all comments or to hold them all off until you have moderated them. Note that there will be people who will be spamming your comments box should you decide to auto-approve everything. This is also where you can quickly reply to each comment and/or edit said comment. – Among the selections on the admin menu, appearance has a lot of sub-menus. The appearance menu is all about how your website will look like on the front-end. Of the sub-menus under appearance, the one you should focus more on would be Themes. Remember how I said WordPress is highly customizable? The themes section is one of the reason for that. Inside, you can select from thousands of free themes for your website each with unique qualities that can differentiate your personal blog from the others. Oh and don’t worry, there is no coding involved. Other sub-menus under appearance that might interest you would be widgets and menus. Advanced users can even go and change the CSS of the website through the editor sub-menu. Like what I said above, everything in WordPress is easy and so is changing the theme of your website. But first, what are themes? Well, themes are visual templates that you can use on your website. Basically, they are pre-prepared designs that, with a touch of a few buttons, you can copy on your website. So how do you change your theme? You start with clicking on the themes sub-menu. You will be taken to the page where you can see all the installed themes for you personal blog. You have the option to activate an already installed theme or add a new one. To add a new one, just click on the button that says “Add New”. You will be then taken to a different page with all the available themes you can use for your blog. Hovering over each theme will give you the option to either check it out, watch a live preview, or install it. Installing a new theme is as easy as clicking on “Install”. 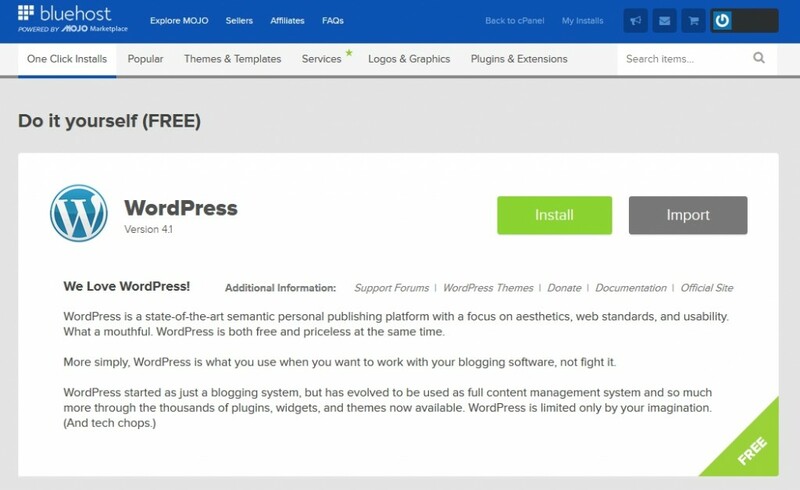 If you have a downloaded theme on your computer, you can upload it by clicking the button that says “Upload Theme” Note that not all themes are free but with the growing library of free themes you might end up finding the right fit for your personal blog there. Now that you have customized the “look” of your website through the use of themes. Why not take it one step higher by customizing the user-experience and usability of your site? To do this, you have to go to the plugins menu. Here, you can check all installed plugins on your blog. You will have the option to activate/deactivate each one of them and to update or delete them. There is also an Editor sub-menu under Plugins for expert users. 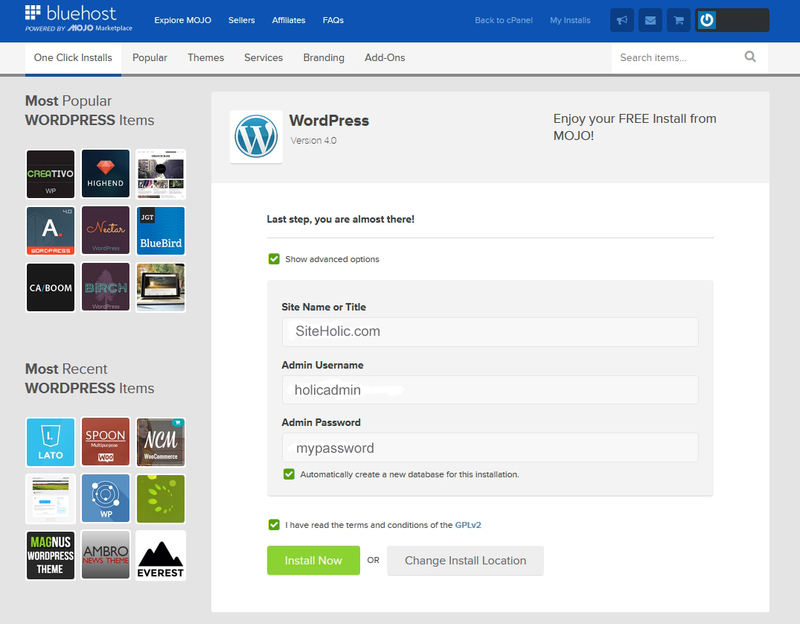 Just like in the case of Themes, Plugins can be installed through the WordPress Dashboard. To do that, go to the “Add New” sub-menu under Plugins and you will be taken to the library of available plugins. The plugins are arranged by popularity or recommendations and there is also a list of featured plugins you can use. Most of the plugins are free to use while there are those that offer superior or special functions that can cost you a few dollars. After you find a plugin you like, just click on “Install Now” and make sure you activate it on the Installed Plugins sub-menu. You can also upload a plugin if you have a downloaded version on your computer. To do that, just click on the button that says “Upload Plugin”. Just remember that installing a boatload of plugins may slow down your website and not all plugins play nice with each other or certain themes. So pick carefully or play around with what works. You can also check out various resources online on what plugins are best for a personal blog. Depending on the kind of website you are running, the Users menu will either be useful or useless. For a personal blog, the users menu can oftentimes be disregarded especially if there is only one admin and writer for the blog. But in some cases wherein a personal blog is managed by multiple people, the Users menu is your friend. Inside, you can create and edit different users ranging from Contributors to Administrators. Various roles have varying responsibilities and clearances. Administrators are allowed to tweak with everything on the dashboard while a contributor only has access to the posts menu. Also, remember that all users have to access the back-end of your website so they will be given a username and password. You can also edit your profile through the “Your Profile” sub-menu. The tools menu is a rather underappreciated menu in the WordPress dashboard but it serves a very important purpose especially for people who are migrating from a different content publishing platform to WordPress or from WordPress to another platform. 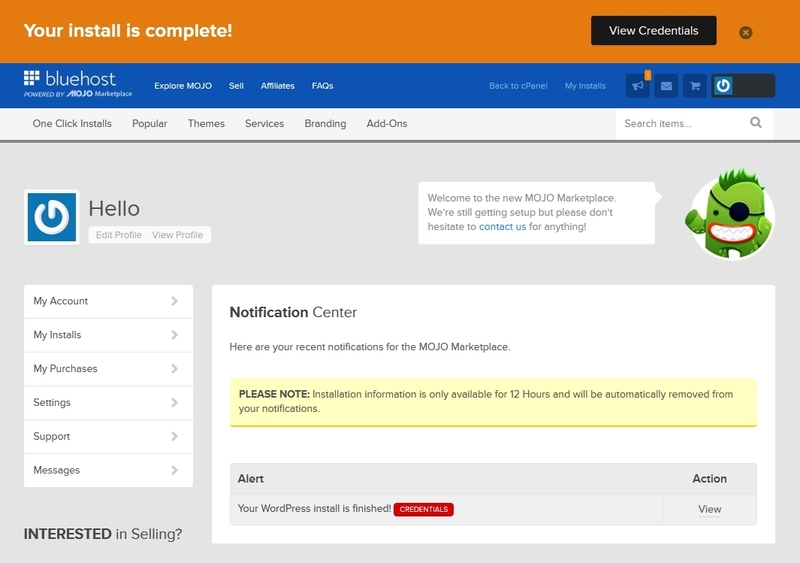 Basically, the Tools menu contains tools for non-routine management tasks on WordPress. The sub-menus you have to check out would be Import and Export. On Import, you will be given tools that will allow you to import posts from other platforms including Blogger, Tumblr, or another WordPress page. This means you won’t have to manually copy and paste each post you have on other platforms. Export, on the other hand, provides tools for you to export your posts to other platforms. – Just like in any other systems out there, there is a menu where you can find all the settings for the page. It has a number of sub-menus and each one has a specific purpose. Just consider it the central hub for the settings for all sections of your WordPress page. If you installed plugins then their own settings might appear as an addition to the sub-menus under settings.The default sub-menus are General, Reading, Writing, Discussion, Media, and Permalinks. The General sub-menu includes all settings that affect your WordPress page in general. These include the title of the site, the site address (URL), Tagline, or Timezone. This sub-menu is also where you can change the registration option for your website. The writing sub-menu has the settings that affect how your posts are handled on your WordPress website. These include the default post categories and the format. Other settings inside the sub-menu include custom content types, update services, and post via email. The reading sub-menu is where you can find the settings that affect how your posts are seen by your readers. This includes the front page displays (whether by latest posts, or a static page), how many blog posts to display at most, search engine visibility, and a “related posts” setting. This is also the place where you can edit the email text sent when people follow your blog or make a comment. Here is where you can see settings that are related to linking your posts with other blogs that are referenced in your posts, the comment settings, e-mail notifications for any comment, and other options for the moderation of comments. This sub-menu contains settings that pertain to the media you upload on your website. This includes upload, size management, and cropping options for images. The permalinks sub-menu contains settings that are related to the URL structure of your personal blog. This includes how your URL is created. The aim here is to ensure that your readers can easily remember the URL of your posts or pages. Also, a good URL structure will make it easier for your to categorize your posts. Options inside the sub-menu will allow you to either use dates in the URL or use the title and categories or a combination of both. They say that any endeavour starts with the first step. I guess in this case the first real step is to decide right here and right now that you will be taking this challenge head on. While the guide is a bit long, it can’t be denied that WordPress is very easy to learn thanks to its well structured dashboard and ease of use. It is best if you go and check the back-end of your WordPress blog while reading this guide so you will see what is referred to. Learning how to use WordPress to its fullest might not happen in mere minutes but once you have a good grasp of the basics you will be taking off the training wheels in no time. If everything still feels confusing to you, don’t hesitate to contact us or post a comment with your question. Me, and other more knowledgeable readers here, will be more than willing to answer whatever question you have about WordPress. If you stuck with any of the steps, or you have any other questions about setting up your blog, please feel free to contact me. I receive about 20 emails every day with questions about starting blog, so it will probably take me about 48 hour to answer on your question, so be patient. You can contact me either way by leaving comment or using the contact form. If you like this guide about how to create blog and you find it useful I will be grateful if you do these two things to help me imrpove it. I really enjoy reading comments from people, who made their first blog, using my guide. Don’t be shy, contact me by email or leave comment below. Usually nobody makes so full step-by-step guides. I hope this one will spread by word of month. If you know somebody who wants to start a blog or you think that this guide will be helpful to your friends please share it, using the social buttons below.